The Pekingese is also called as "lion dogs" or "sun dogs". He is dignified, indepedent, fearless and amazingly stubborn. Pekingese is the very old dog breeds known the Tang Dynasty in China in the 9th century. These dog breeds were only for the Chinese Imperial Court members and their families only. These breed was brought back and developed in England in 1860's. These breeds of dogs was registered with the AKC in 1915. 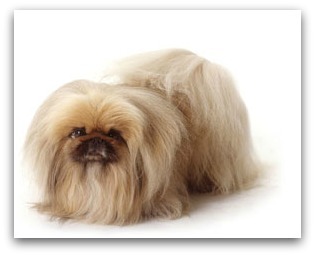 Pekingese has a straight, coarse, long outer coat and a thick and dense undercoat. The coat feathering on the plumed, ears, feet and tail. The coat comes in all colors, sometimes with a black mask, including parti-color. The Pekingese is healthy and cheerful, with the energetic personality. They are very royal, extremely affectionate with their master. They are friendly, playful and tough. Although they is a cute small dogs, but they are fearless when is encountered unexpected shock or danger, will show courage and aggressive side. Although they is a kind of playful dog breeds, but they is a calm dog. Training these breed can be challenge, may be difficult to train due to their stoic nature. The training should train with gentle, firmness, fairness and consistency, and must be very patient on these breed. These dog may need a intensive grooming, at least twice a week. You need to brush his coat with using bristle bruch or curry bomb twice weekly, additional grooming is needed when he is shedding more heavily. Pet owners should often have the coat trimmed short for cleanliness and ease of care. Pekingese must be regularly finishing, is not suitable for the people with a busy life. He does not always get along with the children and will not tolerate rough play, better keep away from the children. They will very suitable to apartment live and no need much exercise.